For Future Doctors: How Much Do Doctor’s earn……………..? One of the common questions I get asked via email and this blog from SPM/STPM leavers is as above. Just recently I had an SPM leaver asking me how much do a heart surgeon earn? From the random survey that I have done looking at these questions, I can only say one thing: majority are only interested in medicine for “good money, good future and good life”, a general misconception. And the reason why many want to become Neurosurgeons and Cardiothoracic Surgeons is also for the same reason: they feel that these are the highest earners in medical field!! Despite explaining many times in this blog, I still get these questions asked to me on a daily basis. Thus, I thought of writing a separate “thesis” on this topic. Someone asked me a few days ago, how much do I earn as a Rheumatologist? Frankly if I were to practice only as a Rheumatologist, my income per-month would not even cross RM 7K! My major bulk of income comes from Internal Medicine practice, which I am also gazetted for. How much am I going to earn per-month depends on many factors such as, how many hours I work, how many calls I do, how many patients I see in the ward and clinic, how many holidays I take etc etc. As I have said many times in this blog, private consultants are NOT paid a salary by private hospitals. You earn what you receive from your patients as consultation and surgical fees, minus 10-15% administrative fee by the hospital. These consultation and surgical fees are regulated by the government via the Private Healthcare Services and Facility Act 1998 (PHSFA), gazetted 2006. So, you are not allowed to charge anything more than what is stipulated in the act. Your license to practice can be withdrawn if you are found guilty of charging more. FYI, these rates have not been reviewed since 1998!! Everything has increased except doctor’s fee……….. The Hospital charges, on the other hand have increased by leaps and bounds since the last 20 years. An appendicectomy that cost about 2-4K in 1998 is RM 7-10K now with the same surgeon fee!! I also know a few consultants who earn RM 100K per-month and their home is the HOSPITAL!! They hardly see their children and do not even take any holidays to be with their family. Either they are obsessed with money or too much passion with their job till they forget their family. For me, family comes first. It is the most important thing in your life and seeing your children grow in front of your eyes is really amazing. How can someone not see this and spend their entire life in the hospital? You can talk about dedication etc but whatever said, family comes first! Secondly, do not think that all those who are earning as such, are angels! Many of them do unethical practices to make up that amount of money. Thirdly, this private practice is a ONE MAN show. If anything happens to you, like you are involved in an accident or acquire serious illnesses, your income will be ZERO!! This is not a business where you can hire someone else to run the show as patients come to see you and not anyone else. Whenever I hire a locum to cover me when I go on-leave, I will always be at a loss! Frankly, it is a very RISKY business model. I know one ophthalmologist who told me that he has stopped doing any work to fix anything in his house by himself because he is worried that a small injury to his hand may close down his business!! Also, don’t forget the higher tax that you will have to pay in private sector. Generally, even with all the tax planning, you will end up paying 1 month of your income to Income Tax department! So, work hard to pay the government …………. As for government sector, everyone is paid the same depending on your grade. It does not matter whether you are a cardiothoracic surgeon, cardiologist, neurosurgeons, a dead wood etc etc, you will still be paid the same amount. Even if you don’t do any surgery, you will still be paid the same! In fact, recently many at grade JUSA C and above have to take a pay cut due to government’s financial situation. Even though government doctor’s salary has improved tremendously over the last 15 years, so does the cost of living and cost of going to a medical school. I was talking to a father who wanted his son to do medicine. His son refused and jumped to accountancy after 1 year of medical course. Well, if the son is not interested, he should not force him. Unfortunately, despite being a businessman (have few construction companies), the father still insists that his son should pursue medicine. What surprises me was the reason why he is asking his son to do medicine! It seems that his son has started “internship” in accountancy and working almost 24hrs a day with a salary of only about RM 2K+. BUT his niece is doing housemanship with salary of RM 4K+. He does not seem to mind working 24hrs a day as long as the salary is higher! So, basically, he wants his son to do medicine for good money and life, based on his perception!! This brings me to another important discussion. Physicians in middle career worked more hours, took more overnight calls, had the lowest satisfaction with their specialty choice and their work-life balance, and had the highest rates of emotional exhaustion and burnout. Middle career physicians were most likely to plan to leave the practice of medicine for reasons other than retirement in the next 24 months. Now, coming back to the starting salary of a doctor, no doubt it looks good on paper (minus the work that you have to do). Many will argue that there is no other job in “Malaysia” that will give you that amount of starting salary. BUT there are many issues that people forget. Firstly, all other professions start their working career almost 2-3 years before you start your housemanship. I know many engineers and even pharmacist who earns more by the time you start your working life as a houseman. My hospital was willing to offer a Pharmacist of 4 years working experience (equivalent to 1st year MO) RM 7K/month salary! Secondly, you can find a job in another country with any other profession unlike medicine. I know many engineers who graduated from UTM working in Singapore. Their starting salary is almost RM 6-7000/month with car and petrol allowance provided! Can you do that with medicine? Only UM and UKM degrees are recognized in Singapore. The rest just have to remain in Malaysia unless you pass any Singapore recognized college exams. Thirdly, how fast does your salary increase after that? My wife has been in service for 17 years. She is now in U54 grade with a net salary of RM 8K +(without EPF deduction as she is under pension scheme). If you are a specialist, you will be at U54 at 10 years of service with a salary of about RM 10-11K, after which your salary will only jump if you get JUSA C promotion. So, don’t get excited looking at the starting figure! It is very slow thereafter despite the introduction of time-based promotion in 2010. When I first entered medical school after STPM, I do not even know how much doctor’s earn. I just did what I felt that I would be good at. Of course, as I have said many times before, no matter how much passion you have, there will come a time where money does matter., especially once you have a family of your own. A person who wants to dedicate their life to mankind by doing medicine would not even be bothered to leave government service. Frankly, government service is where you can serve the people. Unfortunately, there are also many doctors who leave government service due to frustrations with the system. Some of these frustrations have slowly disappeared when the time-based promotion was introduced. These coupled with increasing competitiveness and declining income of private doctors, have reduced the number of doctors leaving civil service over the past 2-3 years. 15 years ago, a private specialist could easily earn about 30-50K/month but now, reaching RM 30K is considered doing VERY well!! And to earn this much you will be working single-handedly, 24hrs a day 7 days a week after 15 years of postgraduate training and after spending almost RM 700K or more (undergraduate and post-graduate, if you are not sponsored by government)…………………..
My advise is always, never to do medicine for wrong reasons !! You will regret it later. If making money is your intention, there are many other jobs and careers you can choose from (much cheaper to do) which can make you a director of a company etc by the time you reach 40. Many of my friends who did other courses have already migrated to other country with good job, salary and life. Some have become managers of their own company flying all over the world. And here I am working day and night treating patients with minimal holidays per year………………………..and worrying everyday as to what will happen to my family if I drop death today! Paga, what you wrote here is very true. In fact, I am surprised that “construction company boss” whom I presume to be very rich, is concerned over the petty RM2k difference comparing his son to the niece. Most rich people I know whose children do medicine (for whatever reasons) live extremely comfortably and really doing medicine as a passion (now). They are never worried of pay increment scheme, on call allowance, taxation, or the upcoming GST etc. Those are “kacang” to them. Like I was once told, you can save RM10,000 a month, and work for 30 years, you will only save RM3million at most. To a rich man’s son, he would probably have a semi-d house in Mont Kiara, and two BMW by the age of 40. So that RM3million is really nothing to these doctors. The moral of the story is – like what you said – do not take up medicine to become rich. This business man owns few companies !! There is another saying that goes around nowadays : medicine is only for the rich as they don’t need to worry about money. The family has left them a fortune……..
Interestingly, their parents are not doctors!! Time based promotion benefits the younger doctors unfortunately. From UD41 to UD54, it will take approximately 12 years, which was how long it takes from UD44 to 48 last time. Of course the smaller “scales” increment are lesser. From UD54 to JUSA C onwards will depend on your SKT (since time-based promotion ends at UD54). Even then, there is nothing to sing praise to, because with the rising cost of living, we are still the poor and barely made the lower ends of middle class, since middle class by definition had to be millionaires by our politician’s definition. I know quite a few doctors who do not believe in private practice, and worked till eventual retirement from public service. These are the truly dedicated ones. Yes, there are many who remain in government service to serve the people. I would have stayed back if not because of the pathetic pay they gave us then and begging for promotion. With 3 kids, I had no choice but to leave the service. Saying that, how many of the younger generations are willing to stay in government service and serve the people when their intention to do medicine is for money! I noticed that fewer government specialists/consultants are leaving to private nowadays. I guess it is safer with better perks though, after considering all the pros and cons. On a side note, with the glut, is MOH still training medical assisants? First of all please allow me to introduce myself. my name is Lee, I’m a cardiac surgeon currently working in HKL and have been serving in the medical line for the past 15 years. Yes indeed reality is cruel, we doctors(especially for HO’s) work literally 24/7,having no personal time for our family and friends, at times will have to tolerate “tantrum” thrown by our superior, and no one would on earth probably understand the hardwork and effort that we put in in saving a person’s life and nobody would show appreciation for what we’ve done. Besides, being a doctor nowadays are not financially as rewarding as it used to be, ok fine. However, I just can’t comprehend why is this blog always discouraging the young generation in taking medicine in one way or another for almost every single blog post? What is the purpose of cultivating negativity into the people who are really passionate in becoming a doctor and would like to contribute to the society? I’m not saying what you say isn’t valid, but everything has their plus and minus, it isn’t fair to always CRITISIZE/ELABORATE/ZOOM IN on something not seemingly that significant especially inclined towards negativity, making people who intend/are determined to pick up medicine to take a step back and have self doubts. At the end of the day, it is NOT helping the situation at all. I hope you are just speaking for yourself and not due to some personal conspiracies behind, because I’m pretty darn sure there are many of us who are aware of the difficulty in reality, but are still continue serving people optimistically because of what we envisioned when we first entered medical school. To the younger generations out there, if you really know what you want in life and have a deep passion to medicine, by all means go ahead and pursue them, nothing good comes easily. You may be firm on your ground Mr. Paga, but there’s always a good side if you would see things in another perspective, only if you would. Even when Malaysia has enough doctors, it will still need about 4 thousand new doctors yearly. Therefore, of course, good doctors (and good medical students) will always be needed. Rest assured, those really interested and committed ones will not get frightened by Paga’s horror comments. That is because their primary motivation is not money in the first place. Of course, doctors still need to take care of his family, so money is still important. That is why many left for ‘greener’ pastures in private practice. Perhaps less so lately, as noted above, as the govt pay has improved significantly since 30 years ago. And realities of private practice hits home. But I think these are information about Malaysian medical scenario that all potential medical students MUST know. Thanks for your comment. I thought HKL has no more cardiaothoracic unit ? The whole intention of this blog is to educate the public on the true life of a doctor and what we do on a daily basis. This is never mentioned in any other blog or will never be told to you by anyone. YES, it may sound negative BUT that is the REALITY. I have been in charge of housemen for 6 years and thought in a medical school for 4 years and have worked in 5 different hospitals and one thing I can confirm and reconfirm is the fact that 7/10 students who do medicine do it for the wrong reasons. The latest survey by UM also says the same. It is this group of students that this blog is directed to. A person who is really passionate will pursue this course no matter what you say. Atleast they will be prepared what is ahead of them when they get into this course. If they have doubt than They are not genuine in pursuing this course. You can ask all those who complain about housemanship and get referred to psychiatrist, almost all of them will say that they never thought medicine was like this and many will agree that they did medicine for good life and money which supposedly made easy via sitting in a clinic and just talking to patients. These are the people I want to educate. Mr Lee, if you have followed Dr Paga’s blog for the past few years, you can clearly see that Dr Paga is just explaining how things are in real life, not as rosy as painted by dubious medical agents and so forth. Being a cardiac surgeon, you PROBABLY have not dealt directly with substandard house officers from substandard universities unlike if in general surgery. Until now, despite all of Dr Paga’s writings in this blogs, those with substandard results in SPM and other pre-university exams are writing in asking how to get into medicin, how to get NOC by MMC etc.. Bear in mind, some of them don’t even have any science subjects in their SPM! I agree that passion is important in medicine, but there is a reason why all over the world only the best goes into medicine. Also, in reality, a lot of people want to do medicine because of the associated ‘prestige’ and supposedly good income, not because of ‘passion’. Even though I am not in the medical line, I enjoy reading this blog and the impression I get is that Dr Paga is trying very hard to inform potential doctors to do medicine for the right reasons. Dr Pagal has mentioned many times (like a broken record) that if you are truly passionate about medicine, go ahead, don’t be put off by the arduous journey ahead. But then some people needs reminding over and over again. So Dr Lee, my take is very different from yours. I have, like you, dedicated 15 years of my life to medical service and I am still in the government service. I am now working as a Head of my unit and a trainer of fellows going into the subspeciality program. I have worked briefly with Dr Paga when I was a HO and I can vouch for his credentials and his experience both as doctor and a medical educator. Paga has never “over” criticize, “over” elaborate or “over” zoom in on the negative aspects of a medical career. He has just merely use this blog to share the reality of what we all went through. He is playing an extremely important role in filling up this ‘real time information vacuum’ in this country. My children seeing how I work have all said that they will not become doctors. They have seen the sacrifices we all made. However if they still would want to take this path, I would believe that it is due to their passion and definitely not for money. And by the way, I was working in HKL till 2011 and I am not aware HKL had a cardiac surgeon recently. Thank you. My One and a Half cents worth of sound. Thanks for your comment. I am always happy to see some of my housemen who have become a specialist and HODs. I am getting old!! Dear Mr Lee. Please don’t simply claim you are a cardiac surgeon. There is definitely no cardiaothoracic unit in HKL. Because of this I will not belief in anything you say. Please don’t misinform the public. Many friends in business went broke in bad time as well as good time. Some are degree holders from overseas. The business environment is just too competitive for everybody. Generally, life being a professional like doctor is definitely more secure and less risky compared to others. I’ve seen many enjoy good lifestyle. Doing business has their pros and cons. You can’t depend on your same business to survive forever. It is the same for doctors as well. I know many GPs who have closed shop and gone back to government sector. I also know some specialist who left back to government as they could not take the heat at private sector. So it is the same no matter what field that you are in. Medicine can only make money for you if you convert it into a business but that does not mean it will last long. 1 legal suit and your reputation will go down as well as your business. However, I do agree that being a Profesional makes it easier to find jobs but even then, the situation is changing rapidly, where many countries are unable to provide job to all graduates. In today’s business, a few hundred thousand dollar is considered small for new start-up. It’s very common in business with high bankruptcy cases but certainly it’s not in professional practice. For doctors, they can always come back and work for someone but for bankrupts, no one will hire you. If I am not mistaken, officially bankruptcy can only be declared by courts. They can get employed but can’t take any loan or leave the country. Not everyone can become businessman. You need a lot of financial literacy and planning. Those who go bankrupt are people who think that they can make money buy just opening up a business with cash in hand. To be frank, degree holders are the worst businessman!! You speak like you have invested 10 MUSD in a company and went broke. Do you read business section in newspapers ? You sound like a joker for a business person. LOL. It’s always such a person like you who goes for personal attack. Why can’t you just talk like Dr. Pagal in his professional way. I totally agree with your article..being a doctor is not profitable and definitely not for the money minded. Even me, when I first started med school I was really passionate about it but after completing my housemanship I guess I sort of “burned out” with the overwhelming workload. I’m sure the old timers like my seniors were worse off since they love telling the story of their HO days but it’s’s not walk in the parkk. I had more than just a few friends in med school and in the hospital who were forced into it either by their parents or gov. And they did not perform well – I assume due to the stress? I’d like to commend you on your article. Very few realise what a long arduous road medicine is. Unfortunately, in our country the people do not seem to realise how much one has to give of one’s self….the years of sacrifice, the stresses, the very real risk to physical and mental health. Being in the top class throughout school, most of my classmates are/were high achievers. Almost all of them, in various fields other than medicine are doing better financially than I am. I’ve been at it, studying and training for almost 20 years! I too am waiting for my time in the sun, when I can afford enough to take holidays, not to count pennies every month, sometimes having to “tighten the proverbial belt” for several weeks until the next paycheck, of being able to afford the best schools for my children. If only the public understood and the pay structure reflected the investment that goes into making someone a sub-specialist or consultant. Just that alone should be enough to warrant a 5-6 figure salary(and I don’t think your comment about those earning >Rm100k doing so because of unethical practices is fair…like in any profession there are black sheep, but I’m sure there are many who have to work 24/7 and sacrifice that much more just to make that amount) when taken in parity with the other professions. As a surgeon, I’ve got about another 20years to make up for what my ex-classmates in the other professions have been steadily acquiring for the last 20 years….and I’m only just beginning! Like you said, medicine is not for everyone. Would I want my children to join the medical field? Well only if they had the passion for it like I did. Otherwise, I’d tell them to find their fortunes elsewhere, as medicine is not where it’s made! Hopefully the public will realise that I, like most other sub-specialists, have spent 20 years of my life, studying, training and working literally day and night, so I can be a better doctor to THEM and all I am asking is that I receive my just desserts. To those considering medicine, go ahead and do it as nothing is more rewarding emotionally and spiritually than medicine but there are a lot better things you can do if wealth or social standing are the main driving factors…or just don’t practice medicine in Malaysia. We probably pay our doctors the lowest in all of the developed/similarly developed countries in the world. The stresses and sacrifices are the same but at least they get a better deal and don’t have to wait 20-25 years before STARTING to earn a decent salary. And I agree with Dr. Sarah’s comment above, not everyone in govt service in medicine is there because they are selfless angels and in a similar vein there are many doctors in private practice who are doing it because they have to. Many would prefer to stay in govt service if it was more equitable. You are probably right, Dr. Pagalavan. Anyway, keep up the good work. I’ve always enjoyed reading your articles in the Berita MMA. Hi Dr, let me introduce myself first, I’m a final year med student in a local university. Yes dr, I have to totally agree with your article. Doctor (regardless of HO, MO or specialist) doesn’t earn much and the road that one need to go through is super tough, especially for those who wish to secure a place in the ‘hot fields’. The working time is much more longer than the others professionals yet you earn only a little bit extra compared to them. If one wanna make money fast, get an engineering degree or business degree and upon graduation, head south to our neighbouring country. But here I would like to shed some light for those aspiring pre-uni students who plan to take up medicine and head over to S’pore to work as a doctor. But like what Dr Paga had mentioned above, first u need to graduate from UM or UKM as SG only recognise these 2 uni in M’sia. Dr Paga is absolutely right that one can earn a lot in SG since the current exchange rate is about RM 2.65 to $1 and the current salary over there, after including on-calls and allowance etc, for HO ranges from $4.5k till $6.5k, MO ranges from $6k till $8k and specialist will be even more. But the future prospect over there is abit risky (bear in mind Singaporeans are not stupid and you will be competing with doctors from all around the world too under the label ‘foreigners’) and is a one-way ticket journey. Malaysian doctors who ended up there mostly will end up as a physicians (5%) or a family medicine specialist (30%) and the rest as a chronic MO, only a few super genius (1%) will be able to get into hot courses like surgery, orthopedics, obstetrics, opthalmology etc. And another point to consider is that SG doesnt recognise external paper, such as MRCP, MRCS, MRCOG, MRCPH etc. Thus to be a specialist in Sg, the one and only way is to get enroll into their specialist programs under their own universities. If you plan to get into a competitive specialist program, u better think twice before going over. Yes, Singapore is competitive. MRCP etc is just to get a MO post for you over there. It does not make you a specialist. You need to show that you are competent and hardworking before being recommended for any training post. I was just glancing through and noted that for foreign non specialists/PR, one will be under conditional registration for 4 years before they able to get full registration, compared for only 2 years for citizens. Not only it is competitive, it is longer for foreigners/PR non-specialists to even get into any postgraduate training. Quite interesting. Which is actually the right way anyway – MRCP syllabus is suitable for entry into a specialist scheme – not to exit a scheme. HKL no longer has cardiothoracic. It’s in IJN and Serdang. I”ve served district and a major hospital . And now,I myself is contemplating venturing to private in hope for a better pay . Not ashamed ,but will miss the appreciative patients in the future if I decide to move on. Hi dr pagal!! I was ur houseman back 2003 in hsa. Now I am proudly saying that I love my job as an emergency doctor (going to be an emergency physician soon, hihi pray for me!). To those out there, u should know why do u want to be aa doctor, revise ur intention n act on it. Peace! It means that it is still underdeveloped unlike in western countries. But of course , it will expand as the country developed. As for salary, it depends at the time you graduate. Gosh for all the spelling errors..
Gentlemen….some of your comments on tax are misleading to someone who has no knowledge of tax system…seem to imply u hv to pay more tax when u work in private sector. The income tax rates applicable are the same whether u work in public sector or private sector or you are self employed or businessmen. If you earn more you are taxable at higher tax rates. Yes, it is misleading to imply that private practice are being taxed more. In general, the rates are the same, depending on which tax bracket you are in. Unless you are registering your private practice as a company with limited equity (Sdn Bhd or Bhd) you’ll be charged under corporate tax rate at 28%. However, do bear in mind that doctor’s in public sector are less likely to evade tax as their income are stated in their income statement which are less likely to be manipulated (Same goes for anyone with a fixed income as an employee). This is different than private practice whereby reported income may differ depending the level of honesty as it is in some form, a business entity (whereby the person has to report their income by themselves). Not really. For the same amount of income you earn in private and government sector, the tax you pay for private sector is much higher. This is because, all allowances(almost 50% of your total income)are tax exempted in government sector. You only pay tax for your basic salary where as in private sector, every single cent is taxable. Oooooo….so all the allowances paid to doctors are not taxable !!! YES, it also applies to all civil servants. Now, you know why private sector workers pay the most taxes in this country! Not all allowances for civil servants are tax exemptable. It is a common misconception for those who does not read their yearly financial statement from e-penyata. The only exemptable allowances for houseofficers/medicl officers are “Imbuhan Tetap Perumahan Awam, Imbuhan Tetap Khidmat Awam and Bantuan Sara Hidup. That is just approximately 12.5% of exemptable income. Other taxable allowances include critical allowances and flexihour for hourse officers. Between civil servant and workers working with a fixed income in private sector, yes, civil servants pay less tax for those having the same income on statement. But for those specialists who open up their own business in private, their declarable income are almost always lower than their actual income. Fixed salary declare their income from their company’s payment slip while those self-declared income for businessman (including doctors with private practice) are always taking a shot by under-reporting their income. So if these businessmen earn “less” with such tactics, they pay less in tax. When the tax exemption for allowances was announce in 2004, all allowances were tax exempted except Critical Allowance, as this is not a mandatory allowance (it can be taken away anytime). However, most doctors include Critical allowance for their tax calculation. As for flexihour allowance, it should be tax exempted as it is a replacement for “0n-call” allowance which is tax exempted. You need to ask MMA to write to MOH and LHDN to clarify this matter. Specialist working in private hospital CANNOT under-declare their income. This is because, the accounts are kept by the hospital and can be easily audited. Only those who are running individual clinics like GPs etc can under-declare as it is their own business and many do not issue any receipts! Yes, that’s why the rich gets richer! I currently am an australian surgical trainee but went through a twinning program in malaysia. Worldwide the situation is the same. 2 years slogging through STPM, 5.5 years of medical school (RM 400 000), 4 years of Intern and then residency jobs to fight for a specialist training place, all holidays spent on attending training courses and doing research. another 5 years of specialist training (AUD45000) and two years of sub specialisation working 180 hour fortnights. Its a fantastic job. But money and job security is really no longer what it used to be. Even in Australia newly finished surgeons are having difficulty finding permanent hospital jobs. Unless you really love it. Don’t do it. Australia still pays relatively well, albeit not as well as the US. There is no shortage of jobs, if you don’t mind regional areas. But yes, getting paid as a doctor is one of the worst jobs, and on hourly basis, trails many other professions. Dave, 45000 AUD annually for residency training in australia, after tax or before? I am more into admin work though it is not so glamour or popular. Mind to share what are the qualifications (besides grade UD54) to be hospital pengarah? Some said need MBA or MPH…or Master in Hospital Management/Admin. I come across many with just basic degree sitting there for years. Pathologist, Psychiatry, Rehabilitation, Forensic, Public Health, Research Advisor for Pharmaceutical giants, Hospital Manager. Listen….listen..Medicine is NOT about internal medicine or surgery only. Many opportunities out there but it seems everyone is just talking about medicine and Sx only. In the past, there is no specific criteria to become hospital pengarah’s etc. Even an MO can become hospital PENGARAH. That’s why you may still see some senior Pengarah’s with only basic degree. However, currently you need MPH to become a hospital PENGARAH or Atleast master’s in hospital management. Yes of course, some of the speciality that you mentioned may consist of office hour jobs. However, the pathway to specialization in these fields are not different compared to internal medicine and surgical fields. Secondly, I was mainly talking about “making money” which is what many wanted to know. Almost all the field that you mentioned above can’t make any money outside as private hospitals do not hire them. Hi there, I’m an oral surgeon…Just introduced to your blog. Yup, what Mr Paga writes is true…If you love treating and serving the community…Medicine is for you…..I remember my housemen colleagues bringing 2 stash of clothes to change over their >24hrs call….And my Paeds M.O housemate had TDS rounds daily.. The time-based salary is indeed beneficial and has encouraged more to stay on working with MoH..I entered MoH 10+ years ago..and actually came back with my postgrad qualifications still as a Grade 41. At that time most of my batchmates & my juniors were already U44s and U48s..Despite that, I was on 2nd call for 365days a year…hehehe..People or rather our medical colleagues will say,”That’s fine, you’re on passive call”…But just imagine that us passive callers who join Surgical/Orthopaedic Surgeons@Emergency OT at 3am are the same people coming back to punch in@8am the very next day….Yup, it is stressful when you look back@it and you can’t go off without informing your consultant you’re outstation for a period of time…But I just LOVE it!! Truthfully, I had more time and energy when I was single and minus 3 girls :). For me, I experienced severe hyperemesis gravidarum during all my pregnancies but I still hit Emergency OTs when planned until my body just can’t take it anymore. Because if you back away, there just won’t be anybody around to take over. Alhamdulillah, my consultant took over whilst I was hospitalised and off work and MoH sent a gazettement officer to help out….Life is tough but if this is your passion and you are sincere in your work and enjoy doing it…government healthcare work is all yours..And if you LOVE teaching, you have to dwell and gain experience under MoH to educate future healthcare personnel… It’s PRICELESS!!!! Yes, exactly. But how many of the current generations are willing to do what you have done. Most of us have gone through what you have gone through but try telling this to our new generation of doctors and they will stare at you.The whole intention of them doing medicine is wrong. No1:Those government doctors who are taking MPH MUST return to KKM with a doctorate degree(DPH). Gone are the days when you can walk around calling yourself specialist/consultant with just MPH. Even if one grad with DrPH, the post for Hospital Pengarah will NOT be offered to you immediately as there are so many many many seniors stuck at UD54. JUSA C is a dream….so dream on. No2: If you think Public Health is easier Master, think again. Do talk to people who are so called doing the “paper work”, working only during office hour and carrying out the research at the same time. What are the challenges carrying out research at KKM facilities itself?Interestingly, the number of DrPH grad is not close to any Master in clinical in all the Unis. Wonder why public health getting so tough suddenly despite not getting much attention. No3: ALL the fields you mentioned are hardly in demand in private hospitals. The secret to make money in private is to be in a field which involves hands on procedures. Surgical fields: ALL are making money…just a matter of how much. To understand the demand in market, simply look at the number of specialists/unit in any private hospital. The most specialists: OBGY, General Surgery, Anaes, ENT…. The not so high demand: Rehab, Patho,. Ironically, the MONEY making business is to build hospital OR chain laboratories….hiring those who are more qualified academically. I am not a dentist to comment much about this. What I know is that dentist generally work less hours as they are rarely called after office hours for anything. The pay in government service is only about RM 200 less than a doctor. As for private sector, it depends how busy is your clinic. The situation of over-supply of dentists is already here.It is going to be worse than for medical doctors. Unfortunately there is no blog like Dr Paga’s to warn intending students of what can be expected in the future. But the worst case scenario is ..”the governement is not obligated to absorb graduating dentists” in the near future. You have to find your own job. As it is now …there are far too many new dentists graduating then there are “chairs” available in the hospitals…so u hardly get any practice…I am told in some hospitals 15 dentists waiting for one chair. Dentists in government practice i understand are not allowed to do anything beyond filling, extraction..even root canal need to be refered to the specialists or seniors. Nowadays as a new dentist you could be sent direct to the Clinic Pergigian in the outskirts ..i mean real rural areas. Suggest u visit some of them and see its condition for yourself…no proper equipment at all…you probably need to bring your own tools leftover from your college. (without exagerating. one dentist told me you can even find snakes inside the clinics). If you want to specialise one day…(that day may never come….cos too many dentists waiting to specialise). Unlike medicine you cant do any specialisation studies on your own…unless your dad can affordhalf a million ringgit. Having said these …please verify the situation with the new graduated dentists who are posted to government service.. Yes indeed true. Under the Malaysia’s official statistics, the oversupply of dentists and pharmacists are extrapolated to hit earlier than the number of doctors. However, the earlier is a relative sense since all of these will occur within this 2-3 years. Heard on the radio at 9pm that entry into medicine will be tightened. Hope it is not a case of too little, too late. Somemthing must be done if you do not want to see unemployed doctors very soon. Such regular shifting of the goal posts is bad. But I suppose needed, as the MoE and the IPTS themselves are unable to regulate quality. The implication is that a large cohort of new and to be graduated doctors got in with lower qualifications, and that spells trouble in terms of quality health care delivery, as we are finding out. It also means it is unfair to the younger students who are now caught by the new rules, when their friends a few years older got away with it. Be that as it may, since the guideline was released in 2011, I have felt it was still way too lax. With grade inflation since the beginning of the last decade, there are enough students with A’s to make the minimum 5A in the sciences and maths at SPM and 3As in A levels. The general consensus in most countries is that medical students should be selected from the top 5% of the annual student cohort. 10% of Matriculasi students get CGPA 4.0, and 18% of A levels students get 3A/A*. There really isn’t any need to look at anybody with lower results. Unfortunately, most of the other mediocre or substandard students with burning ‘passion’ (more like looking for the over-rated job stability and good income in medicine) are going to countries like in Middle East, Eastern Europe etc in which access to medical education is rather easy, with the help and sweet talk of medical agents. Many who attend these universities argue that the reason they go to these universities is that it is relatively inexpensive compared to recognised universities, while many hide the fact that these universities are not grade-centric in admitting students to their medical schools. What is surprising is that many international recognised respectable medical schools for example UK, Australia does not recognised a lot of these local foundation programms, but a lot of these ‘inexpensive’ medical schools stated above admit students from doubtful local substandard foundation programmes. I believe the local matriculation is not accepted as a pre UNi pathway to study in UK. I believe NONE of the medical schools in the UK and Australia recognise local foundation programs. Yeah. If I am not mistaken, Australia recognises the local government matriculation. UK does not. I once had the privilege to review a study with regards to salary in Malaysia. To sum things up, how much you’ll earn is not based on your profession of choice, it’s dependent on the sector that you’re in. Case in point, there are many instances where receptionists in Oil & Gas, Financial or even the Tech sector may earn up to RM8K. On the other end of the spectrum, there’s Hospitality, Construction, and Agriculture sector where the pay is paltry. Healthcare is somewhere in the middle. Salary is essentially based on value and the culture of “reward” ingrained in a given sector, and certain sectors simply reward more irrespective of whether the company is big or small. Dr paga , you know anything about this issue ? thank you . He added that his daughter was turned away by the private hospital as she could not pay the deposit for admission. haha . Government hospitals cannot turn down anyone, even foreigners. This news is not accurate. I believe you doctor and very big thank you! You had put it very well and in the right context. Another wrong reason to do medicine is because the job looks glamour and cool. The movie series ‘House’ also more or less giving misdirection to audience especially Malaysian to become like him. I think a good TV series on healthcare would be ‘Call the Midwife’ BBC drama series based on a midwife’s diary about life as midwives in London in the 80s. It shows you what true midwives/nurses and doctors should be. The professionalism, teamwork, intelligence, skills and charity that encompass this noble field of professions. I think it’s series 3 Jaz. It’s showing now. I have seen series 1 & 2 on DVDs. Really really good. Life were simpler then but happier. The diary finished at series 2. Series 3 is simply the director’s imagination. I think it’s the 50s/60s, not 80s. Good night. Doctor. I come across your blog and I find it very interesting. Thanks for sharing all these useful n insight information with us. 1. I hav always wondering what is “hospital director”? Are they one of the many specialist who help to run the private hospitals? Do they get paid? 2. I realise that there are many health organisations out there. Let’s say you are the president of MMA. Do you get paid? Or holds any position in one of the health organisations out there. 3. How much roughly is the cost of setting up a hospital? Thx for your concern. Much appreciated. Hi. Doctor. Can I ask what’s the requirements for you to reach JUSA 1 in civil service? I heard from ppl that you get dual salary after you retired as JUSA 1 if you come back to work because they need your service. Is it true? N is it only doctors can reach JUSA 1. If I work as a research scientist(government servants of course) in public university. Will I be able to reach JUSA 1? Good night, doctor. There is few questions in my mind that I would like to ask you. 1. What is hospital director. Do they get paid? 2. I realise there are many health organisations out there. If yoy holds a position in there e.g president of MMA. Do you get paid? 3. How much is the cost of building a hospital? 1) Hospital directors are hospital directors aka similar to general manager of a company. Of course , they will be paid as it is a full time job. 3) millions depending on size/number of beds etc. Return of investment will take 5-7 years. Good night. Doctor paga. If I get a phD in genetics 1st. Then I apply for MD. Is it a good way? N After I finished my degree. Can I consider myself a geneticist with licensed medical degree? Nite doctor paga. Hav you heard of “iutic medicine”. I am not sure how to spell it. But it is a kind of oldest medical treatment. It is a 7 years programme and 5 years of residency. I heard normally they don’t receive payment for their services. N they take pulse using 3 fingers to take 3 pulse. That’s all i know. Can u giv me some insights on that? I think you are talking about Ayurvedic medicine which is complimentary medicine. It is not modern medicine. Do IMGs have to learn Malay in order to practice Medicine in Malaysia??????? You won’t get a job in the first place! hello doctor 🙂 i just want to seek ur advise.. what do u think abt dentist in malaysia? im abt to do dentistry in india in few months time.. but i am just a little confused as the beginning salary of a houseman is only 3.5k. Do u really advise me to take up this field, doctor? why do u want dr paga advise whether to take up dentistry or not? u are supposed to be passionate about it if you already applied for it and got an offer. are u in it only for the money or the ‘doctor’ title? u are in the wrong profession mate. do something business related if you really after the big bucks. much more worth it. Why are doctors so rich selling what others have worked so hard to develop? 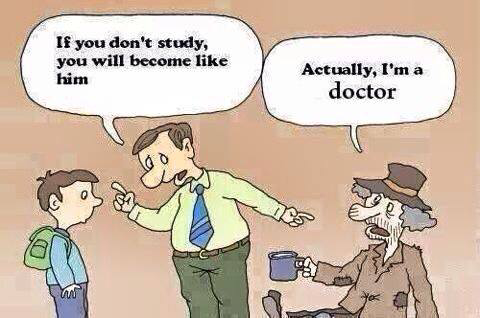 Why do doctors complain for more money, complain for having spent so much time studying for the degree. Many are already doctors at the age of 24 in many developed countries. To do medicine is a personal choice. Many do for status, authority, name, dominance in society, money and playGod. Dear Dr Paga, your article was a good read and it’s message hits home for me. I am also a rheumatologist practicing in public service but in a foreign country. Thank you for sharing. he can’t be a geologist. he is not good in chemistry & physics. he is only good in biology. Dear Dr Paga, allow me to introduce myself, im idzuan form 5 student, one of my most favourite subject is biology so im into medicine but after what you have said it open my eyes, but can u tell me what other job than medicine that focus on biology because i think i can do well in biology than other subjects. loll.. yup to be a good geologist he needs to be good in both chem and physics as well.. because geologist also needs to analyze the geochemistry of rock/fossil for age-dating , and phsyics is required to understand the shear / stress that was exerted on the formation . Reblogged this on Unlucky Student. Dr Paga, can I ask how much does a physician in a private hospital earn. I do not plan to study or work as a doctor. However, I have this annoying relative who works as a physician in Prince Court and has a MRCP from Ireland. He claims to earn RM 40,000 which I highly doubt. But his mom & himself claims he earns that much & use it as a bragging right at every family event. Please read my blog post here. It is a possibility depending on how many hours you work etc , before TAX. A Physician is a Consultant, at least PGY 6+ (read: six years post MBBS). That figure is roughly what consultants earn in first world countries. I dont know what the going rate is for Malaysia. But I think if you are an in-demand consultant, that figure is possible. Overtime, oncall etc factors into their base salary. As a mid-level registrar I’m getting around the equiv of RM25k/mth after tax. I work terrible hours and im often a zombie for doing so. I miss most social outings because im not free on weekends, and studying while working full time is a real pain. This person is in Prince Court which is a private hospital . He should be atleast 10-12 years post MBBS. Dr. Paga, I would like to ask your suggestion about physiotherapy as I was having difficulties in choosing either medicine or physiotherapy. What do u think about physiotherapy in the future compare to doctors?How much do a physiotherapist earn average?My friend said that they are not well paid.I heard that the demand for physiotherapist is increasing. The problem with physiotherapist is that there are too many diploma holders out there. Hospitals prefer hiring these guys as they are cheaper to hire. However, degree holders can apply to academic institutions for teaching and practise. Doctor , thank you for opening my eyes . A pharmacist or a doctor has a brighter future ? pharmacist is still in need in Malaysia. Once the healthcare structure of this country changes, there will be more need for pharmacist. Dr Paga, thanks for giving out so many useful advice, actually I am an a level student, keen on pursuing medicine, just the overload working hrs, and the amount of stress worries me, so may I ask, how do u balance yr life and work now? Currently, u still work 9-5 every day with on calls? Or still got night shift? Around how many hours u work per week? In future, I aso wants to prioritize my family, I dun mind to be busy working in early days of HO and MO, but I need to free myself for my family at middle 30, is that possible for a doctor to have balance life afterward? Hope to hear from u soon thanks. Unfortunately, that will never happen if you remain a clinician! I still work from 7.30am till 6pm with oncalls. In Private you are practically on call everyday as your patients can come anytime of the day. Nurses will also call you if any of your inpatients need a review. And also, do Dr know about the current earning for a pharmacist (works in government)? And as far as I concerned, Pharmacist starts at U41, and normal pharmacist can be promoted highest to which grade? Do pharmacist have a salary increment if they completed their master? Pharmacist salary in government sector is only about RM2-300 less than a doctor minus the critical allowance. They can go as high as a doctor but the promotions are slower. Is there any channel for Medical officer to raise voice for revision of oncall claim? Welcome to Malaysia! This is not a new issue. We have been fighting with this for donkey years now. Mind you, till 2005, MO oncall rate was only RM100 and HO RM25. You can bring this matter up with your state SCHOMOS rep. It is something that SCHOMOS brings up almost yearly with KKM but government can only pay what they can afford. Well Dr Paga, blog like this ( so called REALITY EXPLANATION) in a way doesn’t really help the young ones, well the real REALITY is It’s competitive world now days, so the young ones have to cope and learn to handle stress and in near future, they must live with it . Ask you a question; if the young ones doesn’t know how to cope with extreme pressure, how they going to save life. I see your blog of more like your self pity complaint that you are letting out, I still wonder why you still work 7am till 6pm, hello there still many options out there, choices are still a lot , you can always resign and choose other job. So please stop doing your reality experience. I’m very sure there are many REALITY STORIES WHO HAVE SUCCEEDED BOTH IN FAMILY AND CAREER as a government and private doctors. You are just explaining the negative part of the reality stories, why not write on success part of a doctor, at least you will do good to the young doctors heart. This clearly shows you do not know the purpose of this blog. Talk to budding medical students and 8 out of 10 do not even know what medicine is all about! I am stating the facts and what type of life doctors go through. Those who are not up to it can always find another job or career to go to. Self pity?? If I had regretted working as such, I would have resigned long time ago but I am still working as such. Many other doctors do the same! That’s because we chose this job by knowing what medicine is all about unlike many of the current generation of graduates That’s why there are 30% drop out rate during housemanship! Success stories? Well that is what most people want to hear. Of course in any profession there will be success stories but that comes with hard work and struggle! Hi doctor, I’m not in the medical line but enjoy reading your blog postings very much. The most informative i have came across. Thank you for sharing your experience and wisdom. Would just like to get the truth from you yourself doctor, as I have heard many people saying that specialists earn in the region of rm100-200k monthly. Sorry for asking you direct but i think many future and current doctors out there are very much motivated by the monetary aspect of medicine. So I’m not sure if these specialists are actually having a hard time making money or otherwise. I’m asking this with all due respect to you doctor because i know not all doctors are as such. But if specialists are earning rm25mil in 5 years, im not too sure if they have the patient’s interest at heart. Hope to hear from you regarding this doctor. Highly appreciate your insight. Thanks for your time doc! I think I had written about this in some of my blog articles and also in my books. As for the cardiologist that you mentioned above who supposedly evaded taxes, many of us were also surprised and shocked to see the amount mentioned. We felt that either it is misquoted or he had some other source of income which he did not declare. Most private specialist are earning about 30-50k/month but it all depends on your field of practise, where you are practising, how ethical you are and how many hours you work. Frankly, a doctor who earns 100-200k/month is either in the hospital 24hrs a day , 7 days a week or doing a lot of hanky-panky stuff! Let me put it this way, how can a single doctor have 30 patients in the ward per day and at the same time see 50 patients in the clinic daily? It is almost impossible, if you were to give the best quality of care! There is only so much a single person can do!I use to tell my General manager that if I were to do a Grand ward round in my hospital, 80% of the beds will be empty! you get my point? Yes, I cannot deny the fact that unethical practise to milk the insurance company is rather rampant nowadays with increasing competition. This is because, if the specialist do not do this, he may only be earning less than 30k/month! There are hardly any cash paying patients in the private hospitals nowadays, usually less than 10%. As for doctors who do procedures such as surgeons, cardiologist, gastroenterologist etc, doing unnecessary procedures not based on guidelines are rather common if the patient has insurance. I think I have said and written about this before. Ethical doctors don’t earn much but unethical doctors(aka businessman) will be laughing to the banks. As one of my doctor friend put it ” doctors are the best businessman!”. You will be shocked if I were to open the pendora’s box! I can tell you over a cup of tea if you do come down to JB! Don’t judge a book by it’s cover! Thanks for the information! Appreciate it. I was also thinking along the same lines in a sense that how can these doctors provide quality health service if their concern is only to milk insurance money. But then again i do understand there are genuine doctors who only do necessary procedures and give genuine advice to the patients. And you are spot on doctor. I go to see the gastroenterologist and its always him recommending me procedures that is invasive and sometimes i feel unnecessary. That’s what got me thinking if his primary concern is my insurance coverage or my health im seeing more of my relatives and friends going to government hospitals nowadays as they feel that the government doctors wouldn’t run unrequired tests and cut straight to the chase. As explained by you doc, with the current glut of doctors, i sincerely hope that the situation doesnt get worst! Been hearing scary stories from my MO friends about unqualified doctors doing locums in clinics and god forbid these people from becoming specialists and having a license to kill, like u said! Will definitely get in touch with you doc if im ever down in JB! Sorry if i said anything wrong regarding the profession just wanted to share my experience. Pretty sure there are still astounding doctors out there, like yourself 🙂 God bless! Dear doctor, could you please elaborate more about the pharmacist that is offered rm 7000 salary at the hospital? Im really curious to know why the pharmacist is offered that much. Did he or she have a specific skillset or something? Thanks Doc! He is just a pharmacist but heading the department which is handling the whole Pharmacy service for the hospital.